Have you just installed your window blinds or shades and feel something is missing? What you may be missing is a Window Cornice. A window cornice in its simplest form is a wood box that can be upholstered, painted or stained and is made to cover the top of a window blind or shade. 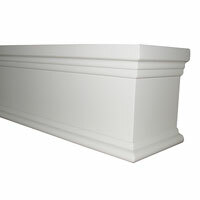 Window cornice s come in many different shapes and sizes and will add that finishing touch to any window blind or shade. For upholstered cornices a fabric must first be selected that will be used to wrap the wooden frame. If your window blinds or shades are white or off white then choosing a fabric that will introduce some color or interesting pattern would be a recommended. You will be surprised how a cornice will change the whole look of your window treatment. If a simple more sophisticated look is preferred then a wood cornice that represents crown molding can be used to top your blinds or shades. Wood window cornices can be painted or stained to coordinate with your interior space and will add interest to an otherwise boring window covering. Posted on December 7, 2011 June 7, 2017 Categories Wood Cornice ValanceTags cornice, cornice molding1 Comment on Missing Window Cornices?